It has been a little while since we’ve heard from the Detroit rap duo. Their last appearance was on Jaylib’s 2003 project, Champion Sound. That same year, FND also put out their debut LP, 48 Hours, an album initially booked to come out on MCA before the group left the label. With Xtended Play, the Motor City rappers have expanded their list of collaborators and stayed true to their approach of fuzzing the line between club music and basement sounds. Probably the most noteworthy hit off Xtended Play, “My City,” is a Dilla crafted banger that describes life in their hometown, “the D.” This track comes correct for Motor City residents who need a little pick-me-up after the Tigers returned home without a World Series title. When the break on the mellow “Blaow” first hits your ears, it’s hard not to note that People Under the Stairs previously used the same drums on their track, “A Fly Love Song.” But FND hold their own as they describe how they live up to their responsibilities of providing for their families. 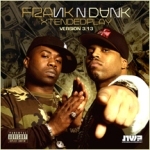 Frank N Dank aren’t going to blow minds with complex rhyme schemes or challenging content. What they are going to do is give their fans what they’re looking for. It’s not gangster and it’s not backpacker. It’s not quite underground yet it’s not mainstream. Xtended Play is just good hip-hop, straight up. This entry was posted in Reviews and tagged Frank N Dank. Bookmark the permalink.